The Weekly Cooking Plan is the ultimate of what can be done on this diet. It caters for a family of four and includes Breakfast, School Lunches and Work Lunches, Snacks and Desserts. It is not necessary to cook all of the recipes as described and flexibility is encouraged. After a few weeks you will find that eating this way becomes 'normal' and your everyday cooking regime will become efficient and easy. 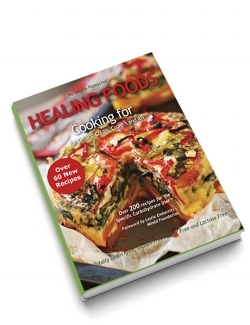 The 'Healing Foods' Cookbook offers weekly and monthly essential cooking lists. They include making yogurt on a weekly basis and making condiments on a monthly basis. One day per week and one day per month to cook all of the essentials and you will be spending a lot less time in the kitchen on a daily basis. Please download the plan and email sramacher@me.com for the recipes and shopping list.